Born and raised as missionary kids Rich and Elisa Brown found each other in high school at the Alliance Academy in Ecuador. Then they went to Toccoa Falls College and started dating. Rich studied and graduated with a degree in Missiology and Elisa with Interpersonal Communications. The two were married on June 23, 1990. One year later, the couple moved to Raleigh, North Carolina, to serve as youth pastor and wife at North Ridge Church. In the four years spent there, Rich completed the ordination process and graduated with a masters degree in Bible and Theology from Wheaton Graduate School. They soon found themselves in Costa Rica and then moved to Peru in 1995. After 10 years of ministry in Peru, Rich and Elisa witnessed the growth of the Alliance youth from 30 in one church to over 1000 in three churches. 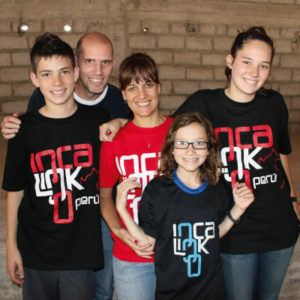 God continued to use their gifts and talents in different parts of Peru until 2005. In 2005, they began their ministry in Ecuador, beginning a network of youth leaders in Ecuador, Peru and Colombia. The plan: To connect youth groups in North America with youth groups in South America through short-term missions. They are called to reach the 300 million youth in Latin America with Christ’s irresistible love. Elisa is part of a Christian Rock band called Corban, which opens all kinds of doors for youth ministry in Latin America. Rich and Elisa have four children: Olivia, Michaela, Josiah and Alexa. All of their children are intimately connected to the Brown’s ministry, especially with short-term teams as translators, Corban and helping in the orphanages and garbage dump ministries.